The book covers “external” (WAI) and “internal” (NEI) training methods practiced by traditional schools of the “Shaolin family” (SHAOLIN PAI). The following proverb has been passed down from generation to generation of people who were occupied in martial arts: “Strength can not overcome style, style can not overcome mastery.” There is one more saying: “Style is the flesh of mastery, mastery (GONG FU) is the skeleton of style.” All this stresses paramount importance of training in the “internal mastery” (GONG FU). Now many exercises presented in the book are almost lost and practiced by very few people. However, earlier they were an integral part of training in traditional schools of Chinese martial arts. Those and similar training methods allowed masters of the past to reach staggering results. Now their skills seem to us supernatural and unattainable. For instance, FEI YANG ZOU BI – “Flying up to a roof ridge and run up the wall”, this skill belongs to the section QING GONG – “Mastery of Lightness”. Or DAO PI FU KAN ER BUNG EN RU – “Swords cut, axes slash but can not harm”, this skill is from the section YING GONG – “Mastery of Hardness”. But those and similar abilities are based on following proper methods, diligence and persistence. That is the main (and only) secret and “no mysticism at all”, as the author writes. The book includes the preface and five chapters. The first chapter covers general aspects of training “internal” and external” mastery. Then requirements to the practice NEI GONG and two exercises for regulation of QI are given. Additionally, there are several exercises from WAI GONG for developing the ability to hit powerfully and to the mark as well as for hardening and strengthening of limbs. The whole second chapter covers YING GONG – “Mastery of Hardness”. It describes a method for developing the ability to sustain cold-steel blows. The third chapter covers QING GONG – “Mastery of Lightness”. A methods of acquiring the ability to run up the wall, walk on a rope, quickly and easily move on the tops of poles is described. 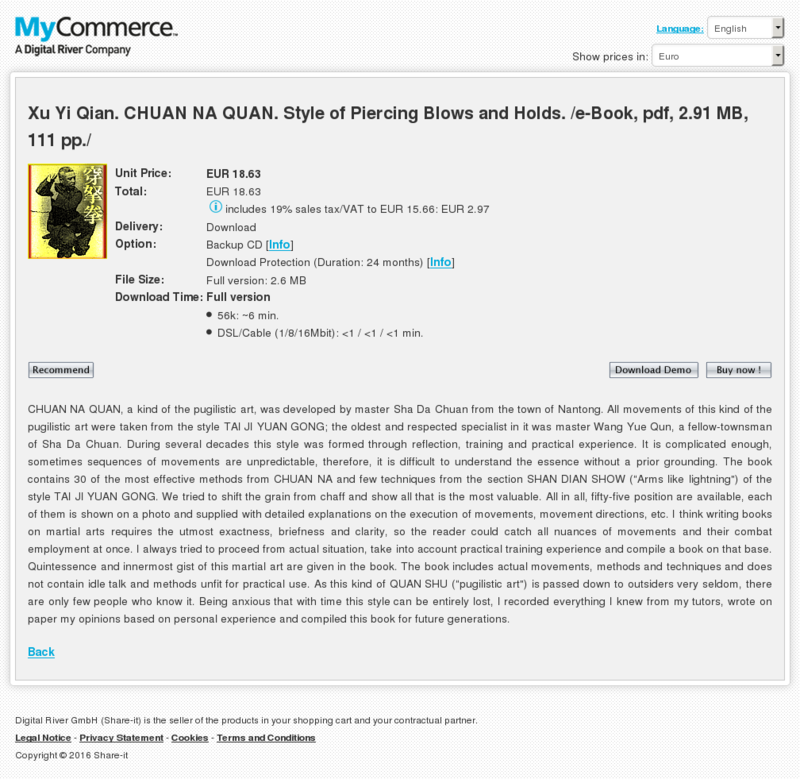 The fourth chapter covers the art MEI HUA ZHANG – “Poles of plum blossom” proper. It contains 15 exercises for developing the exactness and speed of motion and 9 exercises for developing the technique of continuous arm and leg blows at five poles. The fifth chapter describes QI GONG of “Dragon and Tiger”. That practice results in better QI circulation, strengthening the body and internal organs, improving eyesight. CHUAN NA QUAN, a kind of the pugilistic art, was developed by master Sha Da Chuan from the town of Nantong. All movements of this kind of the pugilistic art were taken from the style TAI JI YUAN GONG; the oldest and respected specialist in it was master Wang Yue Qun, a fellow-townsman of Sha Da Chuan. During several decades this style was formed through reflection, training and practical experience. It is complicated enough, sometimes sequences of movements are unpredictable, therefore, it is difficult to understand the essence without a prior grounding. The book contains 30 of the most effective methods from CHUAN NA and few techniques from the section SHAN DIAN SHOW (“Arms like lightning”) of the style TAI JI YUAN GONG. We tried to shift the grain from chaff and show all that is the most valuable. All in all, fifty-five position are available, each of them is shown on a photo and supplied with detailed explanations on the execution of movements, movement directions, etc. I think writing books on martial arts requires the utmost exactness, briefness and clarity, so the reader could catch all nuances of movements and their combat employment at once. I always tried to proceed from actual situation, take into account practical training experience and compile a book on that base. Quintessence and innermost gist of this martial art are given in the book. The book includes actual movements, methods and techniques and does not contain idle talk and methods unfit for practical use. As this kind of QUAN SHU (“pugilistic art”) is passed down to outsiders very seldom, there are only few people who know it. Being anxious that with time this style can be entirely lost, I recorded everything I knew from my tutors, wrote on paper my opinions based on personal experience and compiled this book for future generations. The book "CHIN NA FA" was written by Liu Jin Sheng in collaboration with Zhao Jiang. The first edition of the book was issued in July of 1936 as a manual for the Police Academy of Zhejiang province. The book was printed by the publishing house Shan Wu in Shanghai.Techniques of CHIN NA include a wide set of various movements: press and blows on vulnerable points, grappling, strangling, throws and so on. That set of movements (impacts on the enemy) allows to realize the following methods: "Separation (tearing) of muscles and sinews" (FENG JING), "Dislocating (breaking out) of bones and joints" (YU GU), "Suffocation" (BI QI) and "Impacting on points" (DIAN XUE). Also, those methods must be used skillfully, not just with brute force. Both army and police always attached great importance to this art. The introduction to the book says: "Initially this skill had several names: FENG JING FA – "The technique of separation (breaking) of muscles and sinews"; DI TANG FA – "Methods of combat when lying on the ground"; YU GU FA – "The technique of dislocation (breaking out) of bones and joints" and CHIN NA FA – "The technique of catch and hold." At present the name CHIN NA FA has predominantly become established. Totally, there are 72 methods. The ancient manuscript calls this skill DI SHA SHOU – "Devil’s Hand". Specialists in WU SHU say there are 36 "big" and 72 "small" points on a human body. 36 positions, 72 positions and 108 positions (techniques) are also marked out in CHIN NA FA. That traditional division has been maintained till now since long time when our ancestors created the theory of CHIN NA on the basis of the conception 36 TIAN GANG and 72 DI SHI. But actually, that is only a tribute to tradition that has no great practical significance. HERITAGE OF THE SOUTHERN SHAOLIN. According to tradition the style SHE ZU QUAN came into existence in the Fujian province (South-East China) in the beginning of the 18th century. The founder of the style is considered Tie Zhu, one of several monks who survived complete devastation of the Southern Shaolin monastery by emperor Yongzheng’s troops. After long wandering Tie Zhu settled down in the village of Jindouyang. The village was situated in a remote mountain region in the North-East of the Fujian province where since long time the small nationality SHE lived. In time Tie Zhu opened a school to teach local inhabitants. Later the style was spread among the people of SHE and received the present name. SHE, one of small peoples in South-East China, inhabit mountain region at the junction of provinces Fujian, Zhejiang, Jiangxi, Guangdong. During long time the SHE people led isolated life. Contacts of SHEs with the outside world were limited very much until the middle of the 20th century. SHE ZU QUAN, always being a closed style, was passed down from generation to generation at family schools. The people of SHE used SHE ZU QUAN for protection of their homes and crops, they shared secrets of the mastery very seldom and hid them from strangers. Thanks to such isolation over almost three hundred years combat technique of the style and training methods did not undergo substantial changes, they preserve precious heritage of the Southern Shaolin School practically without any changes until now. Besides the theoretical base of the style, combat methods and techniques the book presents many little known but very effective exercises for developing quickness, hardness and strength. Those three qualities are basic for the whole Southern Shaolin School, they are called “three jewels” in SHE ZU QUAN. In addition, original exercises for developing eyesight, balance, response time, etc. are available in the book. 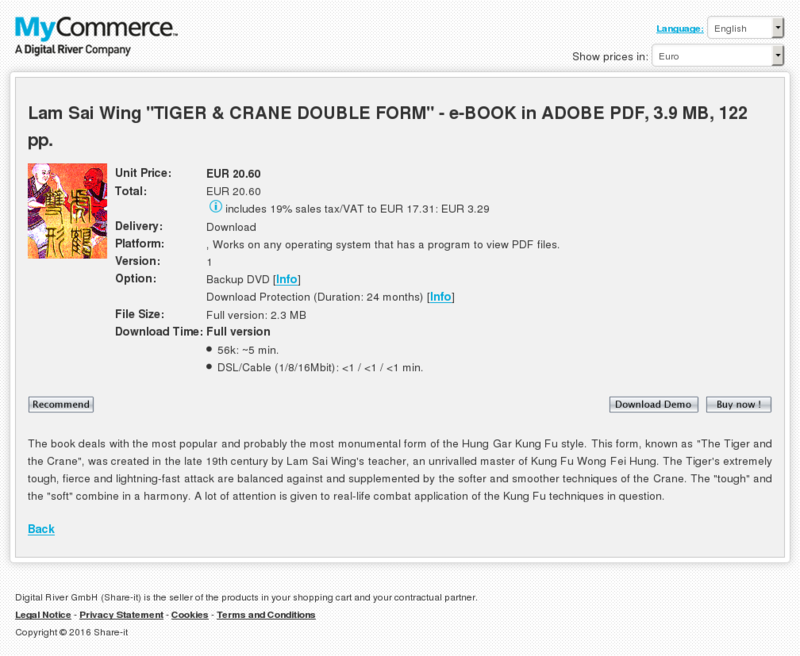 Lam Sai Wing "TIGER & CRANE DOUBLE FORM" – e-BOOK in ADOBE PDF, 3.9 MB, 122 pp. The book deals with the most popular and probably the most monumental form of the Hung Gar Kung Fu style. This form, known as "The Tiger and the Crane", was created in the late 19th century by Lam Sai Wing’s teacher, an unrivalled master of Kung Fu Wong Fei Hung. The Tiger’s extremely tough, fierce and lightning-fast attack are balanced against and supplemented by the softer and smoother techniques of the Crane. The "tough" and the "soft" combine in a harmony. A lot of attention is given to real-life combat application of the Kung Fu techniques in question. Platform: , Works on any operating system that has a program to view PDF files. Lam Sai Wing "TIET SIN KUEN" – e-BOOK in ADOBE PDF, 2.6 MB, 80 pp. Provides a detailed description of the old Shaolin method of "Internal Training" – TIET SIN QI GONG. A master of the "Iron Thread" can withstand, with no consequences, the strongest of blows, including ones with heavy objects or cold steel arms, bend thick iron rods with his hands, and his "rooting power" is so strong that he cannot be displaced by a group of strong people. In addition, this wonderful method strengthens all internal organs, bones, muscles and sinews. The entire body thrives and rejuvenate. Lam Sai Wing "GUNG GEE FOOK FU KUEN" – e-BOOK in ADOBE PDF, 3.5 MB, 103 pp. The book scrutinizes an old canonical form (the Tao) of the Southern Shaolin Kung Fu, the "Gung Gee Fook Fu". According to the legend, the founder of the Hung Gar Kung Fu style, Hung Tziguan studied this form under the tutorship of Southern Shaolin’s best fighter, a Master of the Tiger Style Chzi Shan. The quintessence of Southern Shaolin Kung Fu School. This TAO includes main basic techniques and fighting methods of Southern Shaolin Tiger Style, one of the most effective hand-to-hand system of Chinese Fighting Kung Fu. An old proverb says: “If you exercise only the technique (style) but ignore special training you will be a nobody till your old days.” “Special training” implies particular exercises for developing both WAI ZHUANG – “the External Power” and NEI ZHUANG – “the Internal Power”. Those exercises (training procedures) are collected under a common title – LIAN GONG, literally “Exercising to Acquire Mastery”. In his preface the author writes: “…It is not an idle talk that “Strength can not overcome the Pugilistic Art (Quan Shu), the Pugilistic Art can not overcome Internal Mastery (Gong Fu)”. The people think that it is enough to exercise the Pugilistic Art (Quan Shu) but few know that the Pugilistic Art can not withstand the Internal Mastery (Gong Fu) as the Pugilistic Art is sprouts of Gong Fu and Gong Fu itself is the base and root of the Pugilistic Art. There are people who exercise only Gong Fu and do not exercise Quan Shu. But nobody heard that Quan Shu can be exercised without exercising Gong Fu. Such “mastery” is like flying fluff or floating duckweed – too weak base. It is necessary to exercise both Gong Fu and Quan Shu, only in that case there will be a strong base and excellent Mastery.” The first part of the book presents exercises which belong to the section “External exercising” (WAI GONG) aimed at the development of “the External Power” (WAI ZHUANG). It includes exercises for the development of “hardness” (YING GONG), “lightness” (QING GONG) and “flexibility” (ROU GONG). The second part of the book deals with the development of “the Internal Power” (NEI ZHUANG): the description of massage according to the method NEI ZHUANG XING GONG, the method “Rinsing marrow” XI SUI, some formulae of drugs to increase the level of the “internal power” are given. Undoubtedly, the book will be useful for serious practitioners of traditional styles of Chinese Martial Arts who are eager to reach genuine mastery. The book "Training Methods of 72 Arts of Shaolin" by Jin Jing Zhong is devoted to the most enigmatic and little-known aspect of training of Shaolin monks. The book was written in 1934 with blessing and direct participation of the Head of the Shaolin Monastery Reverend Miao Xing nicknamed "The Golden Arhat", one of the best Shaolin fighters of all times. Training methods described in the book allow to develop supernatural abilities, far beyond abilities of an ordinary man. In the course of many centuries the methods were the base and core of Shaolin combat training, the most secret part carefully hidden from strangers. However, after a huge fire in 1928 that burnt down Shaolin and a greater part of its records the situation changed. An acute problem of preserving the Shaolin heritage for future generations arose. Most probably, it was the principle reason which made Miao Xing reveal one of the main secrets of Shaolin to the public. The book presents full description of exercises and requirements to their execution, as well as the fundamentals of training theory of 72 Shaolin Arts. Book are about methods of acting on acupoints and their practical application in Martial Arts. DIAN XUE SHU that is literally means "The Art of Touching Acupoints" is more known in the West as DIM MAK ("Blows at arteries" in Cantonese dialect) or "Death Touch". It should be noted that the last two names do not fully reflect the essence of this method. DIAN XUE SHU is a profound teaching which is closely connected to Chinese traditional medicine. Besides the martial aspect, it includes a wide range of methods of reanimation and medication. You will be able to read about it in detail in the books which are offered for your attention. Besides theoretical fundamentals, the books give detailed description of the localization of basic acupoints, methods of acting on them with the aims of combat, reanimation and medication, effects of acting on a particular point, methods of exercising fingers and palms, blow techniques and many other things. The history of the creation of this book goes back to Master Fan Xu Dong (life time: 1841 – 1925, according to another data – 1936). At the turn the 19-th and 20-th century Fan Xu Dong several times visited Shaolin Temple where he studied heritage of the monastery. That’s what Master Jon Funk writes about it: “Fan made several trips to the Shaolin temple and spent time there researching with the monks. From these trips to the Shaolin temple, as well as his other work with the Seven Star Praying Mantis system, he wrote five volumes titled "The Shaolin Authentic". These handwritten manuals contained concepts on fighting skills, medical information and historical aspects of kung fu. Contained in one of these five volumes is the eighteen exercises of the LUOHAN GONG complete with replicas of the original drawings of the Shaolin monks demonstrating the postures of each exercise.” These five books were later hand copied in Hong Kong by shifu Huang Han Xun. The original illustrations and calligraphy on LUOHAN GONG by shifu Fan Xu Dong was reproduced in shifu Huang’s book in which he added photographs to depict the movements. This book makes subject area of our web-site somewhat wider. However, the way of martial arts is extremely wide and sometimes it is useful to have a look from a new point of view at what you do and what you have achieved in the end. As the proverb says, “The learner of WU SHU has three precious things: the breadth (of knowledge) is precious, the essence is precious, but the most precious is understanding.” But without first two precious things you can not acquire the third, the most precious thing. Therefore, besides understanding “the essence” of your school you have to be in possession of the breadth of knowledge. As a saying goes, “If there are no breadth and essence, it is hard to read the hieroglyph “understanding”; if there are breadth and essence, the hieroglyph “understanding” becomes apparent by itself.” If you know only your school and style, it is like the proverb says: “Who has seen little is amazed by many things.” The system of knife combat presented in the book was used for training of soldiers from reconnaissance/sabotage units of the Soviet Army. Special Forces of the MAIN INTELLIGENCE DEPARTMENT of the General Staff of the Russian (former Soviet) Army (or, in an abbreviated form, "Spetsnaz GRU") are intended for conducting secret combat operations at the rear of the enemy. Missions carried out by SPETSNAZ troops determine special character and basic lines of SPETSNAZ COMBAT training. "The main mission of a Spetsnaz fighter in a Close Combat is to destroy the enemy with any available means as quickly as possible despite their arms and superior number…". The fighter himself should not be seriously affected, otherwise he could jeopardize the achievement of a fighting mission by his reconnaissance/sabotage team. That’s why the combat training of a fighter from the Spetsnaz is aimed at gaining a flawless proficiency in many types of fire arms and cold steel and traditionally a combat knife is of special importance among them. The basic peculiarity of a knife combat is that it is the combat of short duration. After fighters have approached a striking distance, the result of a fight is at stake within fractions of a second; one or two exact lunges and you win or perish. That’s why the main requirement to a fighter from the Spetsnaz at the initial training stage in knife-combat technique is flawless acquiring of basic methods up to the automatic level: one has no time to ponder in a fight! In spite of the fact that the translation is not irreproachable in some cases (the book has been translated from Russian by the author himself) all methods and techniques are explained in a very clear and understandable way. Besides, over two hundred photos are an excellent illustration to the text. The book serves as a training aid and it is designed for instructors in hand-to-hand combat of the Special Forces and for those who are interested in self-defense with knife.